Jypyä Pop (Turku, Finland) on 6 July 2012 in Lifestyle & Culture and Portfolio. So expressive of that 'age' . . . how things have changed ! @Ronnie 2¢: It is a wonderful representative of his time. Beautiful. It would be great if cars still looked like that. @ursulakatariina: Why should not it be grand. It would shine, shine, and happy petrol retailers. But yes, a big car, a ride would do, if you could afford it. Great find and terrific angle to show the car's classic lines. @Stephen: 60's was gorgeous time. Cars were cars and V8 engine was only right motor. Another fantastic shot !! Have a lovely weekend. A great old beast of a motor, but these are always better shot from the front than the back - don't you think? A great capture with a marvelous angle of this beautiful classic. They surely don't make them like they did in the past . Beautifully seen and captured. 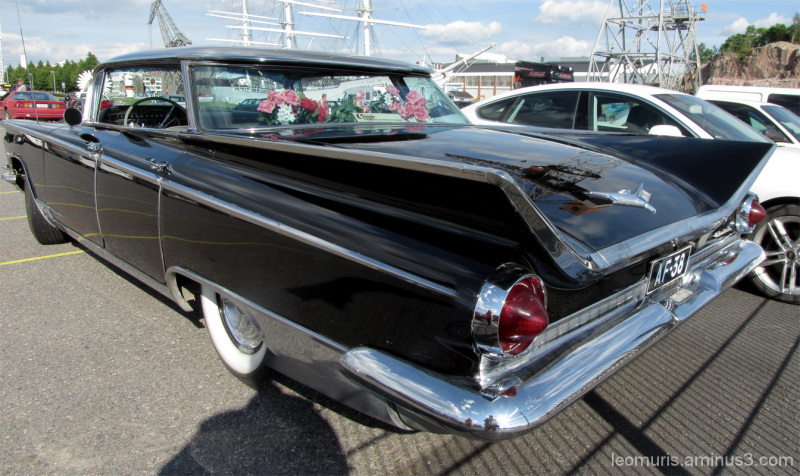 @Laurette: Old cars are something fine. I like them very much. What a great angle! it shows just how huge these old cars were! @Ruthiebear: In the old cars is something to it .. Wouhaaaaa!! superbe la voiture!!!! bien décorée!!! Quelle voiture avec ces aiels fnatastique compo et iamge. @Nicou: These cars were watching feel as though they had their own adolescence. Superb framing for this old beauty ! @Sue-Ann: They were such in those times. @The Mouse: I remember time, when those were new. @Baldwin VW: Thank you. Vain mitä voin sanoa noista vanhoista autoista on, että ne ovat ihmeellisiä. Tykkään niistä kovasti. Une belle forme aérodynamique ! From the era of fins!